Made with 100% all-natural scented lavender oil, this formula is ideal for cat owners who prefer their cat litter to be scented. No synthetic chemicals, clays or perfumes! Your home stays smelling nice, while keeping nasty odors and smells inside the litter. Excellent odour control; I mix it half and half with the unscented variety, and humans a cats no longer sneeze in or around the litter boxes. Love the huge clumps -- I use an extra large scoop in an extra large litter box (one of four such boxes) shared by 3 adult cats and 6 kittens. All I can add is that I love that the bag is clearly marked as to type of plastic it's made of, to make it easier to recycle. Love the large clumps this product produces (for which I bought a larger litter scoop), and love the lavender scent, which is strong, so I mix this half-and-half with the other World's Best Cat Litter varieties. Love this product. After years trying others for my 2 adult cats they easy adapted to this one and no smell. Too much smell and didn't work as well with my litter-robot open air. My Siamese and Himalayan both appreciate this litter. If they are unable to enjoy the outdoors, I get the Multiple Cat version and when they are able to go outside a bit, I get this regular version. I have been buying this product for 8+ years! It wasn't the right match for my two male cats. Even with twice daily scooping it would still stick to the litter box and we could smell cat pee. But, it looks like it works great for everyone else, so it's probably just not the right one for my cats. My husband has *begged* me to never again use any other brand of cat litter! He is very sensitive to litterbox odour, and says World's Best is the only product that has ever made a difference (and the cats like it, too ~^^). As for me -who cleans the boxes- the lighter weight and pleasant scent makes this chore a lot easier. I have yet to find one better but others just don't measure up. I always found clay litters too heavy. Having 2 cats that liked to use the same litter box, in the same corner, made for a mucky mess. I tried pine and crystal litters but missed the clumps. After trying World's Best I wouldn't use anything else. 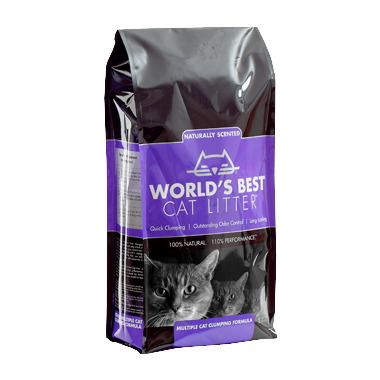 It clumps well, lasts MUCH longer than clay litters, and is healthier for humans and cats alike. It is also completely edible, so no need to worry about kitty injesting a bit while cleaning or is some gets into a water dish. (I've NEVER noticed litter stuck in my kitty's paws with this litter). I didn't like the smell of the unscented versions much, and my cat doesn't mind the lavender scent, so we get this. It also leaves my kitty smelling like lavender, instead of llike 'cat litter'. The only bad thing is that the clumps can be quite large. The company has made a new version that is supossed to create smaller clumps, if that's an issue for anyone. This litter lives up to its name. Dust free, better for the environment and for my kitty, Jilly. More importantly, she likes it too. Since discovering this litter, we use nothing else. Love this litter! I only give it a 4/5 because the smell is quite strong, to the point that my cats won't use the box unless I mix with with the regular scentless corn litter we use also. It does make it last much longer though, and the scent is nice. This is, hands-down, the BEST cat litter on the market. I have 3 cats and despite the fact that the price looks expensive, a bag lasts longer that comparable priced clay litters. It is also better for the environment being corn based and for your furry babies when they wash their paws! It is convenient in that it is flushable. I've been using it for 6 years and never had a toilet problem. I can't say enough good things about this litter!!! Natural lavender scent is great and with 2 cats, this is a great cat litter. I do say to every cat owner BUY THIS LITTER your cats will be happier and less stinky well worth the price!! This IS the world's best cat litter. We use this at home in a litter box that our 2 cats share. Works great. Lasts longer than clay. Minimal dust and the natural lavendar scent is a bonus compared to the other formulations that have the corn scent. I was thrilled to see that Well.ca carried as it means I don't have to carry it home from the store--it comes to my doorstep! Don't let the price of this compared to clay litter fool you, a bag of World's Best is naturally lighter than clay so you get more per kg but it also lasts much longer when in use. It is a natural corn based litter so the smell does take some getting used to (smells kind of farm-ish) but you don't get the ammonia smell you do with clay once the litterbox is used. Plus if they kick it out of the box, it doesn't hurt when you walk on it! I give this litter a 5 out of 5. It is good litter, no dust and does not weigh a ton. the cats like it. I like it.